The Cannon Mountain Aerial Tramway in NH is an eighty-passenger cable car that transports riders up 4,080 feet to Cannon Mountain's summit, in less than ten minutes. Riders are able to view mountains in four states and even Canada on a clear day. Once at the summit, visitors will find amazing scenic walking trails, a bar, a café, a 360-degree observation deck, and restrooms. The tramway features the highest lift-accessed point in New Hampshire, provides an exciting ride for visitors of all ages, and offers spectacular views of New Hampshire, New York, Vermont, Maine, and all the way to Canada, making it a must-visit attraction for anyone in the area. The Aerial Tramway is typically open for the season, from the beginning of June until the middle of October. The Cannon Mountain Aerial Tramway is North America's first passenger aerial tramway. Operation of the cable car began in 1938, with nearly seven million people carried to the summit of Cannon Mountain by the first tram. Visitors to Cannon Mountain can enjoy the eight-minute scenic ride in one of the two enclosed cable cars to the mountain's 4,080-foot summit to enjoy spectacular panoramic views of the distant mountains and valleys. Each car can hold a maximum of eighty passengers and travels vertically up 2,180 feet. Walking paths from the tram station lead to observation tower at the summit. While the Aerial Tramway is a must during the summer and early fall months, Cannon Mountain is particularly popular as well during the winter season with skiers. Skiing opportunities on the mountain include ninety-five slopes and trails for people of all skill levels. The tramway area is also home to the New England Ski Museum. The Cannon Mountain Ski Area is located in the White Mountains on Cannon Mountain. The ski area is the most vertical one in the entire state at 2,330 feet. Cannon Mountain is found within Franconia Notch State Park in Franconia, New Hampshire, and features ten ski lifts that provide service to 265 acres of skiing. The state park is situated at the center of the White Mountain National Forest. Franconia Notch is a stunning mountain pass crossed by a unique parkway that stretches from Echo Lake at the northern end to the Flume Gorge at the southern end. 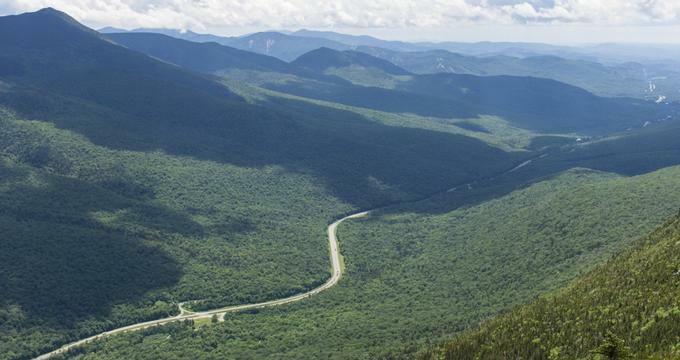 I-93 winds its way for eight miles between the tall peaks of the Franconia and Kinsman mountain ranges. Franconia Notch State Park is also the site of the famous Old Man of the Mountain, the "Great Stone Face" immortalized by Daniel Webster and Nathaniel Hawthorne. Visitors to the area can also stop by the Flume Gorge Visitor Center while they are at the park and walk through the well-known Flume Gorge, as well as spend some time at the New England Ski Museum, and take a ride on the thrilling Cannon Mountain Aerial Tramway. Guests of the park can also go for a swim at Echo Lake, fish at Profile Lake, or look for falcons and hawks on Cannon Cliffs.